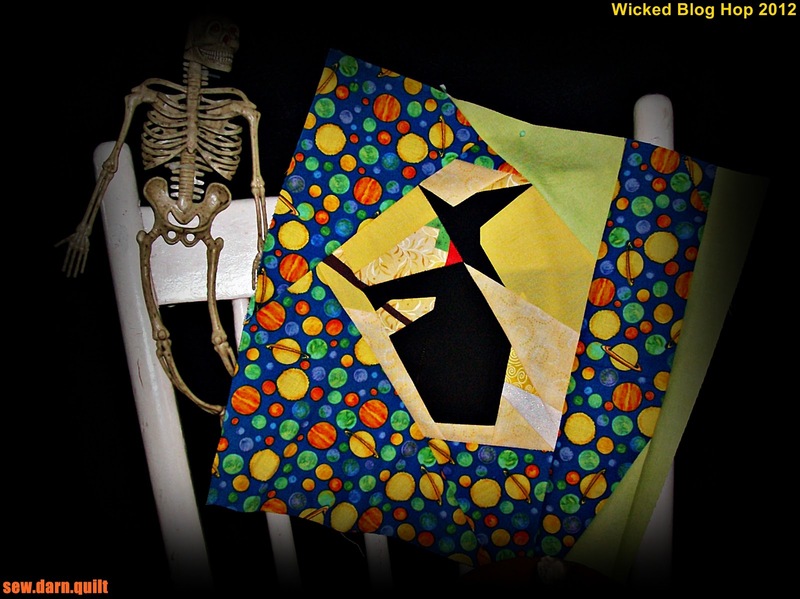 sew.darn.quilt: Wicked Blog Hop with a side order of GIVEAWAY! 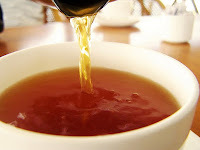 so grab a cuppa tea, coffee or whatever you fancy and get comfortable. Is it time for a refill or top up? Go ahead, we'll wait for you! Visit all these amazing blogs to see what marvelous eye candy awaits. I just kicked it up a notch with the wonky borders! "Meowing Mistress of the Night"
about the gills, poor Deary! The final offering is one of my own designs! Hey, that feels pretty darn great to say that it's "my design"! She's ready to get "Wicked" and have "Fun"
it helps to enhance her pearly white fangs, don't you think? especially since she ate her competition! Let's not forget that Halloween is all about 'Tricks or Treats"
TREATS of the GIVEAWAY kind, right? 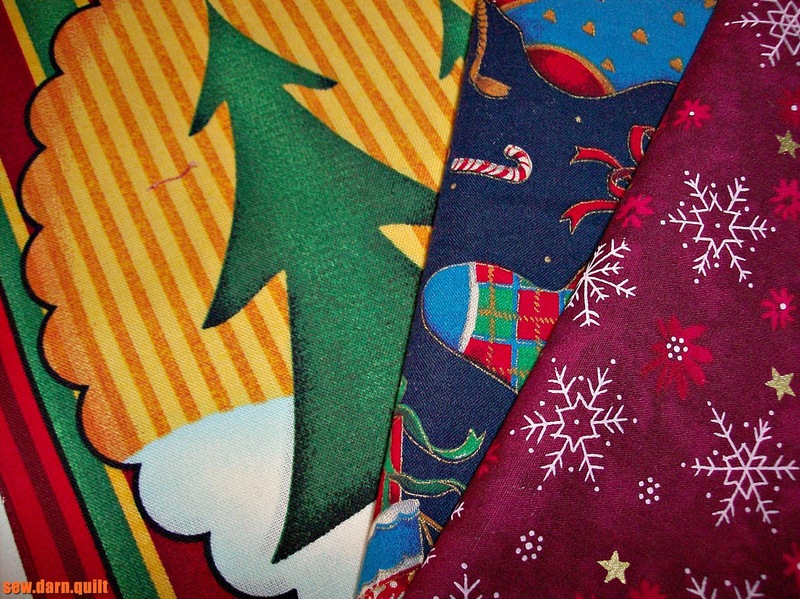 How about some Christmas FQs and 2 mini panels (great for mug rugs!)! Christmas is tiptoeing up on us! I'll post the winner after I get up November 1st! 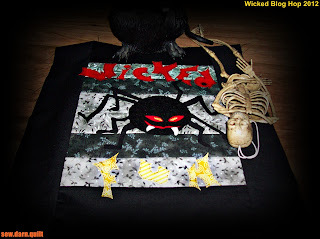 now please go visit the other blogs listed above and have a spooktacular time. 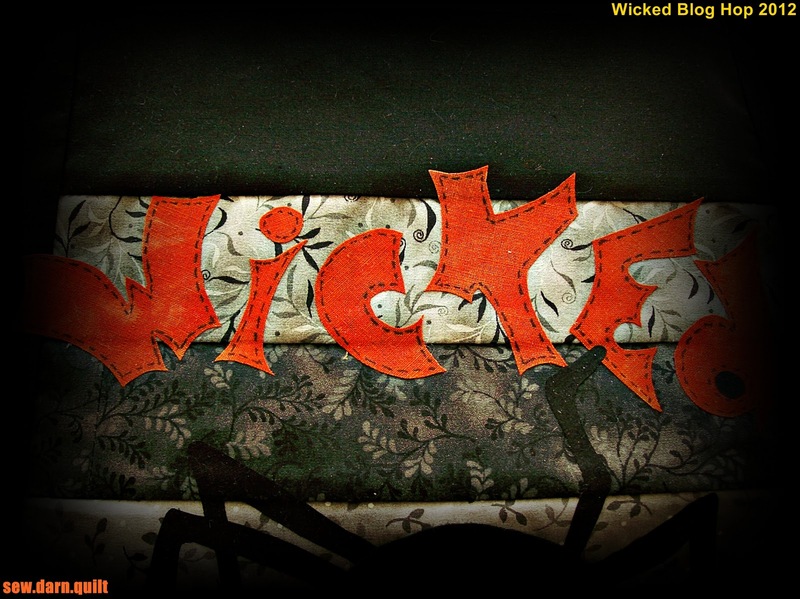 Wonderfully wicked blocks! Great fabrics and colors to really highlight them - and love your skeleton prop. Thank you for sharing with us today. I love your wickedly excellent spider! It is my favorite block! 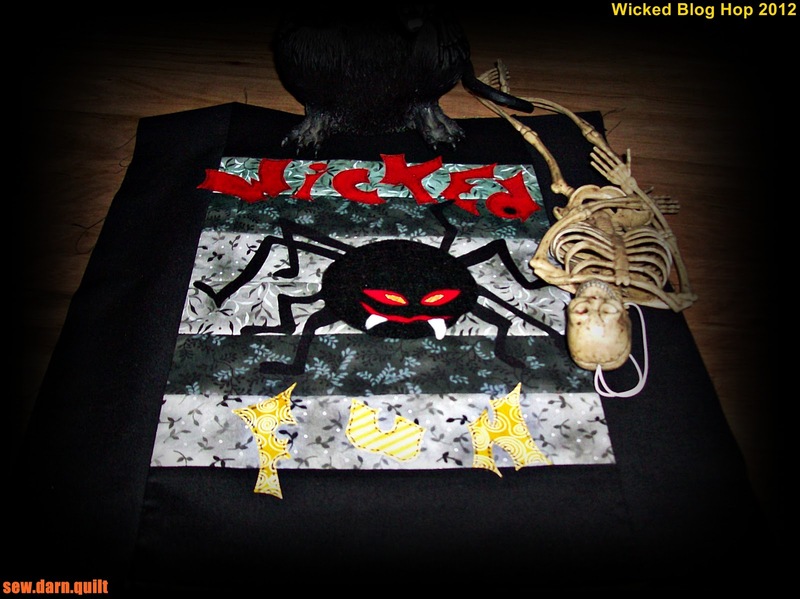 Thanks for sharing all your wickedness! Hi!!! All of your blocks are wickedly cute!!!! I love the cat done in the red background!!! Love Spiderella in red lippy!!! Too Cute!!! Oh I am already a follower and thanks for the fun give a way!!! We will all need Christmas fabric quick now!!!! Oooh they are all fabulous - I particularly like your spider though - great legs! Thanks for the chance of the giveaway too. Great blocks! thanks for sharing and for the chance to win! They're all fabulous blocks but Spiderella is definitely the Queen of Wicked here - I am in awe of your paper piecing, it's perfect. All your blocks are great, but Spiderella is definitely my favourite. I love your paper pieced blocks. They look perfect. The pumpkin is my favourite. I would love to go in the draw for the give away. I have just joined up. I am a follower and i love wonky borders and wonky blocks! Oooooh! I like all your blocks (that wayward witch is great), but I just love your Wicked Spiderella! Amazing. Great blocks! I especially like the cat!! Great blocks. Each one is better than the last. Your blocks are great! I used Sonja's witch too! I love all your blocks.They are just beautiful! Have a fun wicked weekend! 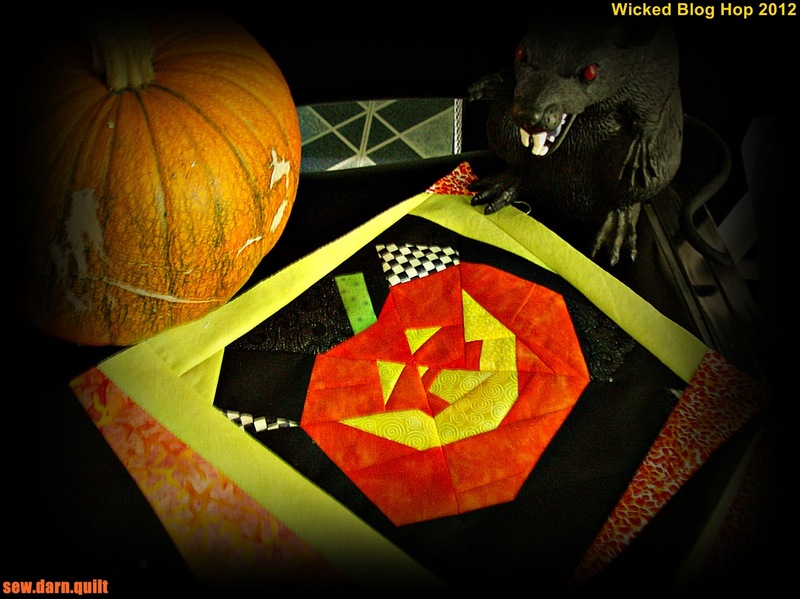 I also love Sonja's paper- piecing patterns but your spooky spider is wonderful. I just love those blocks. Your spider is wicked! OOOOOOHHHHH MYYYYYY Carolyn....what fabulous creations...no really...very scary, especially your spider..you were most certainly on our top choices today...wow.. Your blocks are so cute. Love everyone of them. Thanks for having a give away. Spiderella is charmingly creepy! Thanks for the great blocks and the giveaway! Great job.The spider is wicked and I love the face on your pumpkin. Thanks for sharing. 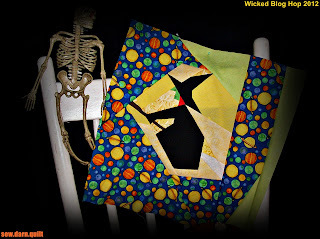 You sew the right amount of wickedness in your blocks, I like them very much! Spiderella is ofcourse my favorite! thanks for sharing. I am a follower. Thanks for the opportunity to win. sew cute I really like how you took the pics of your quilts they seam to glow. great job ! an d thanks for having a give away too. Love the pumpkin block. Thanks for the great giveaway. These are so fun! I love the spider with her red lippy, nice touch! Thanks for sharing! Your blocks are wickedly wonderful today! Wow! Great job! I'm already a follower, by the way! Wicked blocks. Thanks for sharing! Love your WiCKeD Blocks! Thanks for sharing! I LOVE your spider block. Wickedly wonderful. What wonderful blocks! They are all so "wicked"! I am a new follower. Can't wait to see what else you will come up in the future. I am one of your newest followers. Thank you for the treat. And I LOVE all your blocks. Spiderella is wickedly creepy as are your other blocks--love it! 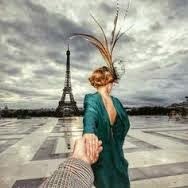 I follow you, of course. My favorite is the spider block! Thank you so much! Carolyn - your blocks are crazy wicked. Looks like you had great fun making them. Happy Halloween! I'm a new follower. You can find my blog over at mountainquiltworks.blogspot.com. Such cute blocks and fabrics. I love your wicked spider! It is a great pattern! Awesome, awesome blocks! Thanks for sharing those. Those are fun blocks, I especially love your spider. Thanks for sharing. I'm a follower and I love your spider also, it is a great design. Your block's are gorgeous. thanks for the opportunity on a wicked draw. Lopve all of your blocks! Great job. I am an existing follower and thanks for the opportunity. Your blocks are adorable, you do great work with paper piecing. I really need to get better at it. My favorite is the spider, he is cool. I am a follower, and thank you for the great giveaway. Hope I am lucky. 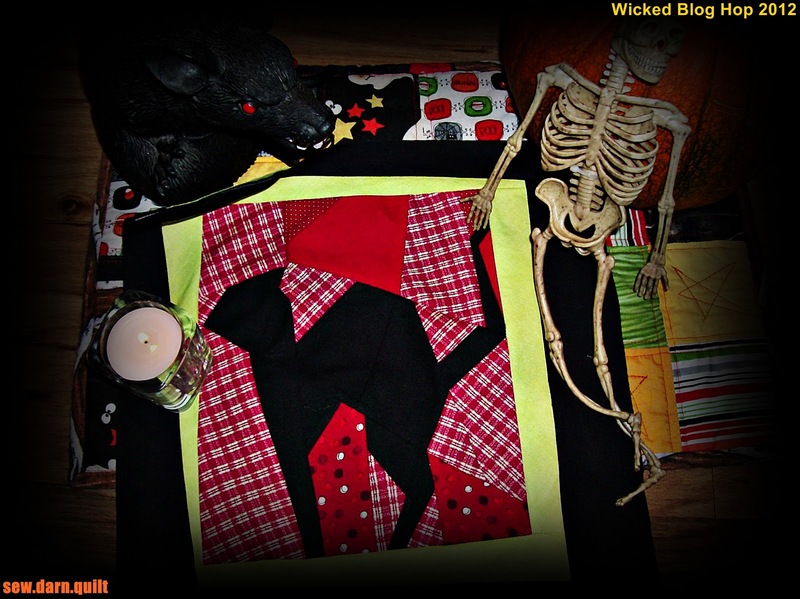 You are one WICKED sew.darn.quilt Magician. I love spidy! I hope I win! Thanks for the Scary time...HOWL-B-BACK! It's me again...your KWITLY PLEASURES stalker! I have been following you for some time and I won't stop even if you call Ghost Busters! Thnx for the give-away! Love all your blocks, but Spiderella is my favorite! Thank you for sharing and the great giveaway. Great blocks....love Spiderella...so happy she's not 'real'!!! TFS and for your sweet giveaway! 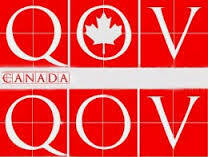 Rosemary B here: I love your blocks. I love the photos too!! Thank you for sharing your massive creativity! Love them all, but especially your creepy spider! Nice job! Haven't tried paper piecing but your block make me think I should give it a try. Love the little spider, wicked good! Thanks to the hop I am now a follower! Spiderella is awesome and what a great design!! Congrats. I would LOVE to win the blog candy. Count me in!! I am a follower of your very creative blog. Youn did an excellent job on the paper pieced blocks! I have such a terrible time with that. Love your spider too! Loved all your great blocks! Thanks for being part of the hop. Great job at designing your spider block! It is wickedly fun! They all are fantastic. Thanks for sharing! Thanks for the wicked eye candy and giveaway! Love your super cute wicked spider block!! I've never designed a block of my own, it has to have a special thrill being able to say you did. She is perfect for creepy Halloween. Your blocks are too cute! And...one can never start toooooo early for Xmas, so nice giveaway! This is one terrific collection of blocks. Great job, thanks so much for sharing them with us. Spiderella is my favorite, they all look great! Spiderella is amazingly glamorous and vicious, all in one!I like her STYLE! I hope you write a tutorial and then post it--the world needs a cool spider gal! Awesome blocks! And I love your design! Thanks for participating in the blog hop & for your generous giveaway ! All of them are fantastic! Love the spider! I'm following! Love the blog hop. Those are really great blocks. Thank you for sharing. Love the fangs and of course red lips. Every lady knows you have to look good to get the meal, ahem..guy. Thanks for the wonderful blocks. You make getting up to see the blogs special, love your blocks and paper piecing I really enjoy. thanks for the give away. Happy halloween. I am now a follower. Enjoyed your site. Your blocks are great. I love that lime green in there. All of your blocks are great but Spiderella is my favorite ,so darn wicked .I am a new follower ,thanks for the chance. Your blocks are awesome! I love Spiderella. Will you be making the patttern available in some way? Thanks for sharing, I am inspired! wicked work thanks for sharing! Your blocks are so cute. Wow! Pumpkin was great, the cat even better, witch "green lips" even better, but your spiderella is over the top. I love your "dark" photography, it takes it up an extra notch! Oh I love all your blocks!! I love the scrappy background fabrics in each block!! Oh, my, "SPIDERELLA" looks awful frightful and wicked!! Congratulations on a well-designed block! Loved the witch with her green colored complexion. Happy Wicked Halloween. I am amazed at your pictures which show off the theme. I don't have a clue how you were able to do that but it surely is effective. Even the black backgroud for the comments is right on track. Blogs are creative!! I love the blocks you made and Spiderella is wickedly beautiful. Thanks for sharing and the great give away. Awesome blocks! Love those red spider eyes. Very good job on those blocks! Thank you for sharing. 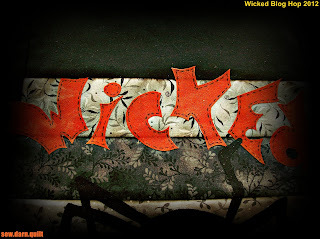 What wicked blocks, especially your Spinderella! Great blocks and boy, is that spider scary! I follow you happily already. Carolyn, I love your Wicked blocks! Especially your scary design, Spiderella... eeeeek. ;o) She's fangtastic. I'm now a follower. Spiderella (love the name) is fantastic as all of the other designs. First, I love your blog name...so cute! 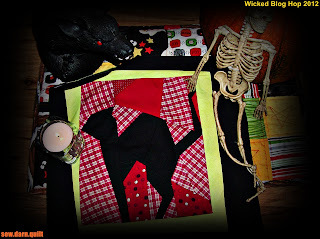 Next, i love the witch block...also cute, and love the giveaway...tres cute! Some spooky papaer piecing...I just can't get the hang of it! Good for you! I'm a brand new follower. Hope you'll come over and return the favor! Your blocks look great, especially Spiderella! Thanks for all the wonderful blocks for us to look at! Am a follower. Wicked Carolyn! Love Spiderella! Keep her on your side of the country please. Thanks for sharing. Spiderella is wickedly wonderful. Thanks for the post - lots of fun. Love Spiderella! Her fangs are an awesome touch!